There are some interesting things at play here between the music and the stories behind it, but the movie gets a little too long-winded and tiring in it’s second half. Oliver Stone’s movie the doors is absolutely an oliver stone film in every sense. That means when he goes for story and the ways things came together for the band, the movie excels in greatness, but there are plenty of other times when he goes for something else. Edginess and being extreme. these scenes don’t work because they go overboard. We don’t care about Jim Morrison’s relationship with a gothic witch who drinks blood. We want to see more of Jim with the band. There’s a lot to like about this movie, and plenty of great moments, but the film definitely loses its way toward the end. If only it wasn’t Oliver Stone making this movie. To be fair, another director could have made it a whole lot worse (just imagine Terrence Malick making it), but stone is hardly the best candidate for the job either. 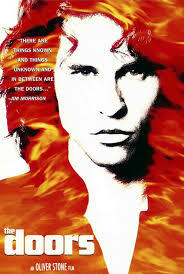 The movie is about Jim Morrison more than it is about The Doors. That’s okay, because he is by far and away the most interesting character of the bunch and the last thing we want is a movie like that thing you do which follows each member of the band separately. So, for what it’s going for, this movie has a pretty solid approach. The film starts with a young Morrison as a boy, driving through the dessert with his parents. They are on one of those deserted roads that seem to go on forever, just cruising along with Jim asleep in the back. The mom wakes him up to see the beautiful sights they are passing and just then they come upon a car accident. There is a Native American family sitting on the side of the road with the woman crying and screaming. Then there’s an old Native American lying on his back, ready to die. Jim stares into the man’s eyes as the car drives past. This is what I mean by Oliver Stone playing it up too much. He’s a guy who over-dramatizes everything. Soon we are with a college-aged Morrison as she shows a movie he made to his film school class. They critique it claiming that they don’t get it and that his work is crap. When asked to explain it to them, Morrison walks out. That’s when Ray Manzarek (Kyle Mclaughlin) approaches Jim and says that he really dug the film. Morrison says he’s got poetry to share with Manzarek and they go to the beach one day. While on the beach, Jim tells Manzarek that he actually wrote songs, and then sings one to his friend. Manzarek is blown away. These scenes are all great. In fact, they are among the best of the movie. They show the building blocks for how The Doors came to be. No sooner does ray respond favorable to Jim’s music, however, does stone start jumping the gun. We cut to a garage and their are two other band members there (played by Kevin Dillon and Frank Whaley. we don’t learn anything about these guys or see the progression of how the four of them came together. instead, we go from Manzarek to everyone in a flash. while I didn’t need a story for each character, it would have been nice to at least see how each one was brought in. were these ray’s friends? what was their first meeting with Jim like? What did ray tell them about Jim when he approached them with the idea? None of these questions are answered. Still, the movie continues in the right direction, making the first scene with those two new band members is the scene where the group writes the song “Light My Fire.” this is of course the most famous song of The Doors, and I like how this scene takes the time to show us the guys molding it and developing it. We hear the original version that Robbie Krieger (Whaley) writes, and then listen to Morrison take it over and make changes. This movie even traces the way that Manzarek figures out what she are the starting and ending beats to the son. It is all pretty perfect. But it’s the only scene like that in the movie. Now I’m not saying that a whole bunch of scenes about how they came up with the sound for each song would have been ideal, but a little bit here and there would go a long way. Maybe there could have been moments when Morrison got something from real life and used it for inspiration for a song. Then in other moments, he could have written a song for someone, based on something that happened. But this movie isn’t really interested in how the songs came to be. Instead, it’s more about Morrison the person. A large part of that has to do with Morrison’s relationships with women. His main love interest is Pamela (played by meg Ryan) a sweet girl who thinks she can tame Morrison. This movie came out at a time when Ryan was being type casted as America’s sweetheart from movies like sleepless in Seattle and when harry met sally. While that brought her great success and fame, she didn’t like it, because she thought she was capable of doing more, edgier work. The Doors was one of these more rebellious roles. Her character, Pamela, loves Jim the artist, but can’t believe the ways that he walks all over her. One of these ways is by parading other women around her without the slightest bit of care. There’s one woman in particular, named Patricia (Kathleen Quinlin), who Morrison starts up an affair with. Patricia is a news reporter who gets Morrison’s attention when she asks him about his parents. Soon they are doing wild things together such as performing satanic rituals and drinking blood. This whole storyline about Patricia is director Oliver Stone going overboard, delving into things that are hardly relevant to the story of The Doors. There are definitely interesting moments to the story, like when Morrison gets angry with Patricia calling his mother. But like much of the later portions of the film, it drags on too long. The best scenes of the movie are the ones that involve the band and the music. There are some great moments that focus on the lyrics of songs and how people respond to them. When The Doors play on the Ed Sullivan show, for example, they are asked to change some of their lyrics for network television. Then when Morrison sings “the end” to a crowd, the people in the audience start freaking out when he sings about what he would do to his mother. It’s almost as if there are two stories being told here and unfortunately they don’t both work. There is the story of the band and then the story of Morrison. The story of Morrison is the one that focuses on his relationships. It is the story of the band that keeps this movie interesting. Oliver Stone is a sensationalist and he overdoes most of the moments that really happened to the group, making them seem more extreme than they actually were. Take the Ed Sullivan show for example. There was no close-up on Jim’s face as he said those scandalous lyrics, and there certainly was never a pan down to what was going on in his pants. But that’s Oliver Stone for you, a guy who allows him to get too sucked into the graphic nature of what he’s doing, instead of the storytelling. By the end of the movie, Morrison can barely stand up as he rambles and mumbles into a microphone on stage, while also spinning around. That’s pretty much how a lot of the second half of this film feels. Very disjointed and dizzying. It’s the scenes of the whole band and their creative process which keeping brining the film back on track.